Malta coach Pietro Ghedin has another option in attack as last week it was confirmed that Qormi striker Alfred Effiong was granted Maltese citizenship. Effiong has been in Malta since 2005 and married to a local girl for the past five years. Last autumn, he was ap-proached by Qormi FC president Redeno Apap who enquired whether the Nigerian-born forward would be interested in applying for a Maltese passport. The application was approved by the authorities last week, thus opening the way for the 30-year-old Effiong to play for the national team if he gets selected. The move could not have come at a better time for Ghedin ahead of this month’s Euro 2016 qualifier against Azerbaijan as the Italian is looking for an adequate replacement for Michael Mifsud who will not be available for the Group H match due to suspension. Reliable sources told The Times that Ghedin has been monitoring Effiong’s performances lately and he could be in line for a call-up ahead of the international friendly in Georgia on March 25 and the Azerbaijan qualifier in Baku three days later. Contacted by Times of Malta yesterday, Effiong said he was pleased that his application was approved. However, he insisted that it’s still early to talk about a national team call-up. “My application was accepted and now I am a Maltese citizen,” Effiong said. “I have been living here for 10 years now and I have also started a family with a Maltese girl. So, it was natural for me to apply for citizenship. “Now that this process is concluded I’m looking forward to give something back to this country and playing for the national team would be a great honour. “However, it’s not like anybody can just walk right into the squad. Effiong has been a regular starter for Qormi this season and established himself as the club’s leading scorer with seven goals. His last netting was on Sunday in Qormi’s 3-1 defeat to Valletta which left the side bottom of the table. In Malta, Effiong also played for Valletta and Ħamrun Spartans but admitted that at the moment he is struggling to produce his best form. 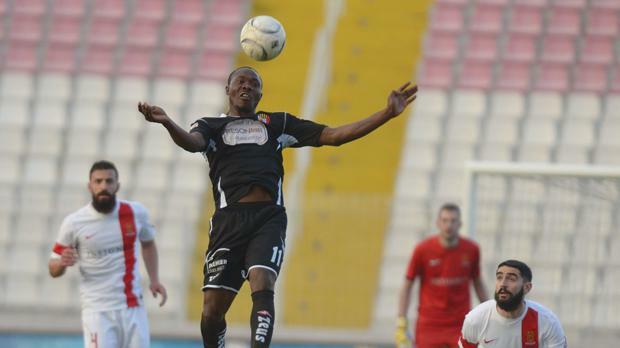 “I’m not particularly pleased with my performances for Qormi,” Effiong said. “I feel that I could play much better. Unfortunately, I haven’t scored a lot of goals this season and, inevitably, that affected the team as we are fighting against the relegation. “There are still a few matches left though and I think we’re still in time to avoid the drop and keep Qormi in the Premier League next season. On Sunday, Qormi still finished on the losing end despite playing for more than half the match with a player more following Steve Borg’s dismissal eight minutes before the break. “True, we were playing against a very strong team,” Effiong said. Apap reckons Effiong will be an asset for Qormi FC and the national team. “Alfred Effiong has given a lot to Maltese football with his un-doubted skills these past ten years and I think it was appropriate that he got a Maltese passport,” the affable Qormi FC president said. “When in peak form Effiong is one of the best strikers we have in the Premier League. It would be a pity if he was overlooked and not considered for the national team. “But Ghedin will surely give him a chance now. No doubt, Effiong will be a great addition to the squad.